Nina’s Lil Bowtique ships to U.S. states. Current process time for orders is 8-10 business days. For RUSH orders, please email us prior to placing the order. International shipping is also available. ‘Gift’ packaging is available, additional shipping charges may apply. International customers agree to email Nina’s Lil Bowtique with shipping address PRIOR to placing order to receive quotes. The minimum international shipping charge is $9.95. Customer understands that additional postage charges will apply on large orders. Customers agree to prepay shipping costs. Nina’s Lil Bowtique ships USPS First Class and Priority Mail based on weight. Products are carefully packaged and boxed. Shipping rates may vary based on the size of box. Nina’s Lil Bowtique does not ship to P.O. Boxes. Nina’s Lil Bowtique accepts returns on unworn products within 14 days of delivery. Refunds are issued 5-7 business days from receipt of returned merchandise. IMPORTANT: A Returned Merchandise Approval number (RMA #) is required before merchandise can be returned. Please Contact Us to obtain the RMA#. It is the customer’s responsibility to provide Nina’s Lil Bowtique via the Contact page with tracking information and reason for returned merchandise. 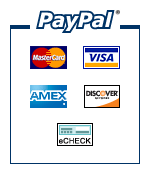 Nina’s Lil Bowtique accepts Visa, MasterCard and PayPal. All credit card orders are subject to final verification and approval. Items will be shipped after verification and approval process is complete. Nina’s Lil Bowtique will email customer with tracking information.